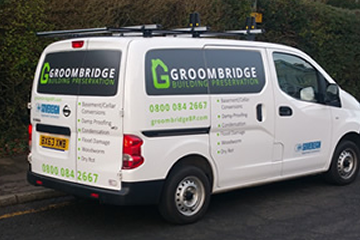 Groombridge Building Preservation is a family run business focusing on all aspects of damp and timber treatments for residential and commercial properties serving all of Kent, south east/west London and across to the East Sussex and Surrey borders, Our experience covers a wide range of treatments including damp proof course installation, condensation control, dry rot, structural waterproofing, external water repellents, beetle infestation, flood damage repair and cellar conversions. We can also provide damp reports for a nominal fee which can be deducted from any works that may need carrying out. Newly founded in 2015, our expertise builds on our founders (Tim Groombridge) own personal knowledge and experience gained from 9 years consulting and specifying for householders, builders, architects, surveyors, landlords and fellow trades to deliver great results. Our reputation is everything and we pride ourselves on our work and providing the best service possible. being an approved contractor all our guarantees are backed by SOVEREIGN CHEMICALS LTD which gives you peace of mind that the works are carried out to their high standards. We only use materials that have the appropriate certification such as BBA approval. Impressive. From first phone call inquiring for woodworm treatment (they came out same day to quote) to completing work was all within one week. Polite, friendly, helpful company. Fast, efficient service. Why look any further. I would definately use Groombridge again if required, and certainly encourage my friends to use them if asked. I am extremely pleased with the way Tim dealt with my condensation problem. He was extremely helpful and certainly knew what he was doing. I would have no hesitation in using this firm again, and can thoroughly recommend them to anyone with a damp problem.